Laramie, Wyo., March 8, 2014 – Three decorated football players, a high-scoring basketball player, a champion skier, a legendary track & field coach, a dedicated administrator, and an historically great men’s basketball team comprise the latest class of the University of Wyoming Intercollegiate Athletics Hall of Fame. 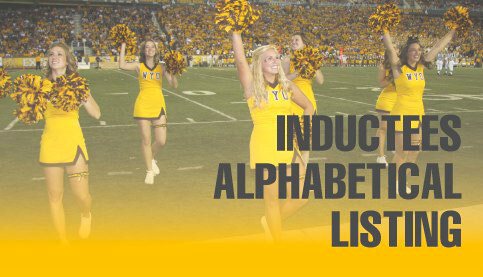 The dinner and induction ceremony for the Hall of Fame’s 22nd class will be held August 29, 2014, at the University of Wyoming Conference Center & Hilton Garden Inn Ballroom in Laramie. This year’s inductees include: the late Dennis Baker (Football, 1975-77), Becky Simning Eriksson (Skiing, 1979-81, 1984-85), LeRoy Gabriel (Administration, 1961-1995), Harry Hall (Basketball, 1966-69), the late Duane Schopp (Track & Field Coach, 1984-97), Mark Smolinski (Football, 1958-60), Jack Weil (Football, 1980-83), and the 1933-34 Men’s Basketball Team. The Hall of Fame is asking for help from the public in finding family members of the 1933-34 men’s basketball team. We are searching for relatives of players Jack Bugas (originally from Rock Springs), Ray Christensen, Stanley Christensen, Arthur Haman (originally from Aurora, Ill.), Taft Harris, John Kimball (originally from Lincoln, Neb. ), Leonard Kuiper, Haskell Leuty (originally from Denison, Tex. ), Eddie McGinty (originally from Wheatland), Oliver Rollins, and Willard “Buzz” West (originally of Kansas City, Mo.). We have already located family members of Coach Willard “Dutch” Witte, his brother Les Witte, who played on the team, and Lloyd Dowler. If you have any information on any of the players listed above, please contact Kathy Hearne at the UW Athletic Department at 766-2292 or e-mail kdhearne@uwyo.edu. A total of 135 individuals and 14 teams have been inducted into the Hall of Fame since its inception in 1993. Its plaque display is located in the concourse of the Arena-Auditorium. The Hall of Fame Committee met in February to make its final selections for this year’s class. The inductees must fit into one of five categories: student-athlete, coach, team, athletics staff members or special achievement. The special achievement category includes individuals who have contributed to the ideal of sports at the University. Each nominee must receive at least 75 percent of the committee’s vote to be eligible for induction. Nominations are encouraged and are due in to the committee by Sept. 1st in order to be considered for the following year’s class. For more information, see the selection criteria.